One of the most volatile slots from Williams Interactive. Not 3 or 5 but 11 reels in total. Two ways to win the bonus and stacked Wilds to boost your wins even more. 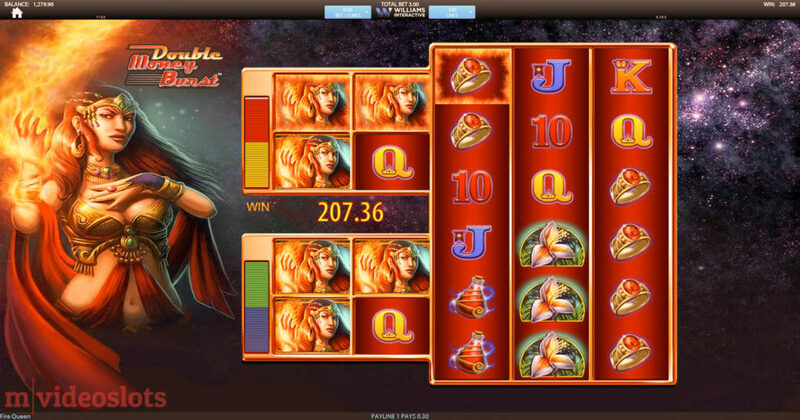 It’s the one and only Fire Queen slot and it’s a perfect alternative especially to the Raging Rhino fans. 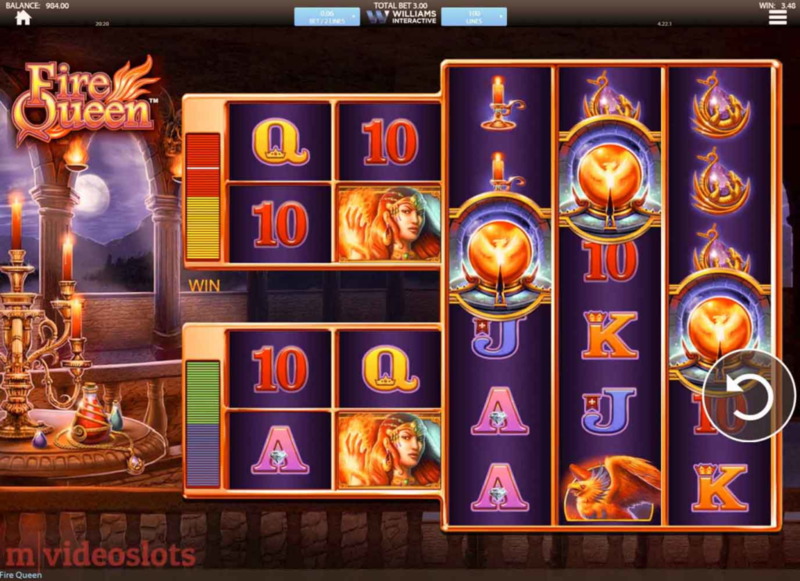 Here’s the complete review of the Fire Queen mobile slot and its high-risk gameplay. That’s around 65x the total stake in the Fire Queen mobile slot base game. It’s not just Money Burst but Double Money Burst game engine that powers Fire Queen. And as we now know, this is not a regular 5-reel video slot, but one with 11 independent reels and 5 columns. And to make it even more complex, they are divided into 3 sets: lines 1-4, 5-8 and 9-11. This makes for two small reel sets and one colossal reel set. And so that you know for sure, lines pay as usual, beginning from the leftmost reel. Also, despite the fact that there are a whopping 100 ways to win, the minimum bet is just .50 credits. Just remember that it’s for two lines, not one. So bet .02 credits to wager all 100 fixed paylines at .01 credits. What to Expect From Fire Queen Symbols? 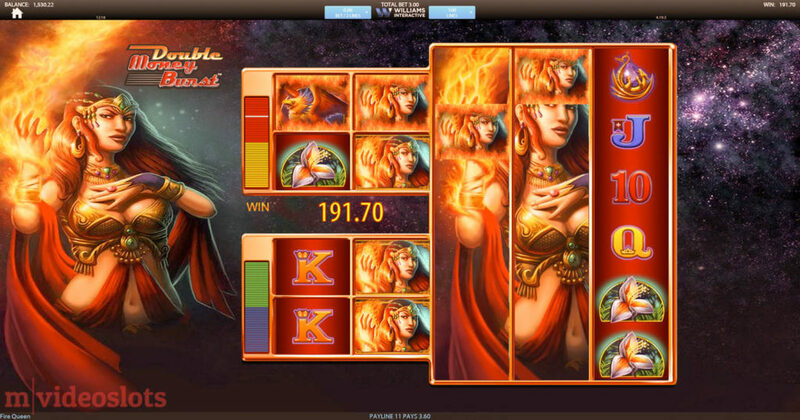 Fire Queen symbols include the mythological Phoenix, Fire Horses, Flowers and the beautiful Fire Queen herself, which pay just up to 8x the total bet. 70x the total bet there. The good news is that the Queen is Wild and she knows how to mirror herself onto other reels as if by magic. What’s more, the above Wild is also a stacked one. This means that whenever the Wild appears on the first 2 reel columns, it will transfer itself to the other reel column in its corresponding position. For example, say you trigger four Wilds on the four small reels at the top. They will then mirror onto the four bottom reels, so you’ll have twice as many Wilds on the screen. See an example of that in the image below…. Wild symbols can transfer on the smaller reel-sets. This Williams Interactive slot also features a bonus. And unlike traditional video slots, there are two very different ways to trigger the Free Spins bonus in the release. 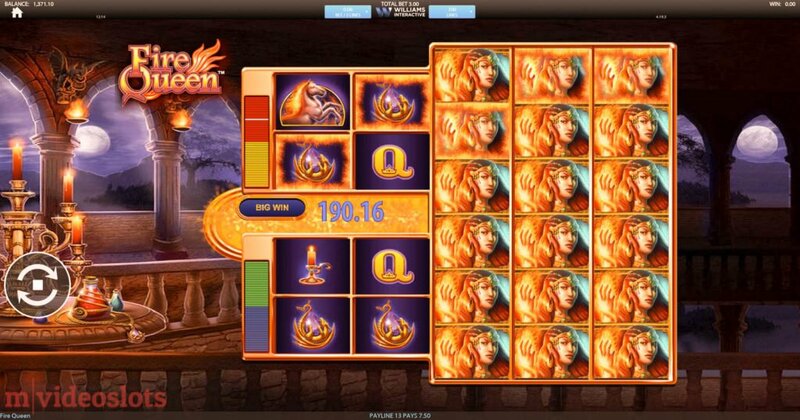 They are all quite straight-forward, and in the case of the Fire Queen slot, the Rising Phoenix bonus symbol only appears on reels 9, 10 and 11. So one way of winning the bonus is to get the bonus symbol on the 3 Colossal reels like in the image below. Bonus symbol appears only on the bigger reel-set. Another way of getting through to the bonus is to match any 4 symbols on one of the smaller reel sets. In theory, you need to win four-of-a-kind on reels 1-4 and/or 5-8. And if you’re lucky enough then these could well be the Wild cards. Is there any difference between the situations how you trigger the bonus? 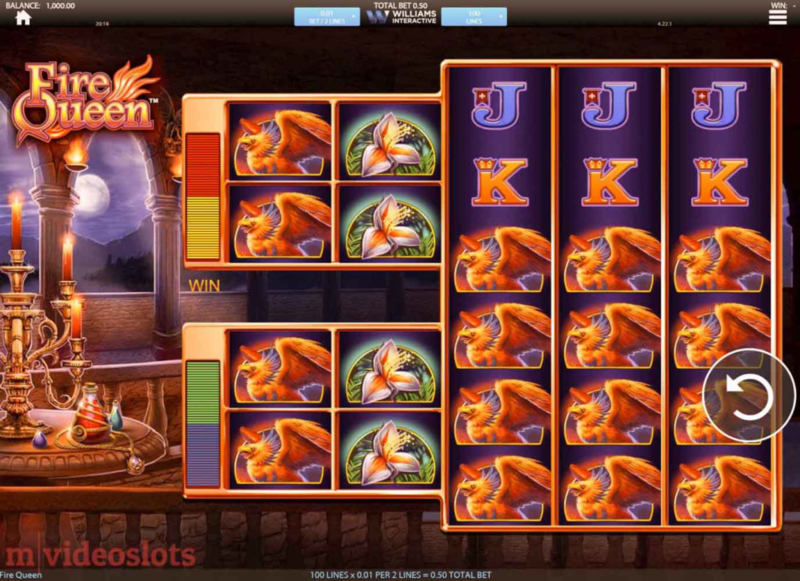 If you trigger 3x Bonus symbol on reels 9-11 (Colossal ones), then you’ll win 5 Free Spins. However, if you trigger the bonus on the smaller reels, you’ll win 20 freebies instead. And remember — in this case four of the same symbol that trigger the feature will stay in their position until the end of the spins (hopefully Wilds). Trigger 3x Feature symbol during Free Spins on reels 9-11 to win 5 more spins. Has Williams Interactive managed to implement all of their 70+ years of experience in games like Fire Queen? Very high risk and intensity gameplay + 100 ways to win across 11 reels. High paying Fire Queen Wilds that can transfer to the opposite reel set. 2 different ways to trigger Free Spins with or without fixed Wild symbols. You can play Fire Queen for free to test all of this without any risk. Elvis: The King Lives — the exact same game engine + Enhanced Sound Presentation system for audio. Giant’s Gold — 100 winlines + 2 reel sets with stacked Wilds and doubling Free Spins. Zeus 1000 — win up to 30 Free Spins with a special Zeus Add symbol boost feature. You can play them all at Casumo right here. 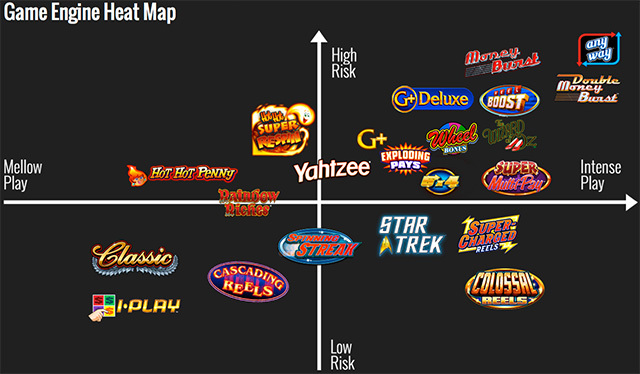 Do you remember that Game Engine Heat Map, that Williams Interactive had at some point on their site? It offered such a great way of monitoring the game’s performance. It took into account just two factors: risk and game intensity. And all of the game engines — including the Double Money Burst — were placed on it. The Double Money Burst Game Engine is among the most intense and riskiest games in Williams Interactive’s games portfolio even to date. Only Any Way (Raging Rhino) Game Engine offers even more variance and is quite similar in terms of action or Intense Play. Have a look at the image below to see what I mean.